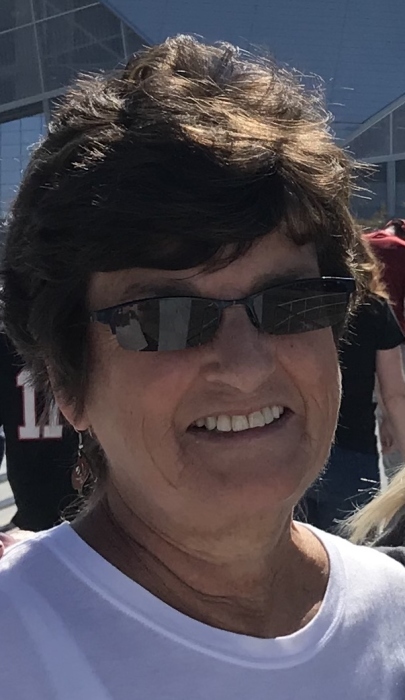 Martha Fay Feeley (June 16, 1947-February 1, 2019) passed away at Mease Countryside Hospital in Clearwater, FL after a brief illness. She was 71 years old. She is survived by her husband, Jeff Feeley (Clearwater) and their daughter and son in law, Jessica and Michael Mason (Lutz) and her beloved Doberman, Gracie. Martha moved with her family from Northborough, MA to Clearwater, FL in 1982. In June, she completed 21 years of service to Delta Airlines as a customer service agent at Tampa International Airport and retired. Previously, she had worked for Air Canada and Wardair in the same capacity. She was a 1969 graduate of Elmira College in Elmira, New York. Clearwater’s extraordinary beaches were not enough to keep her away from her dearly loved Cape Cod, where she had spent at least a summer week every year of her life. Martha and Jessica were both rabid Bucs fans and season ticket holders since 1998. Martha’s story was an epic story. She and Jeff first met when they were 13 year olds in Junior High school. She sat the seat in front of him in homeroom throughout junior high school and high school. Her school locker was directly below his during that same time frame, which was a good thing as she was 5’3” and he was 6’3”. He began walking her to and from school and carrying her books their sophomore year in high school. Their parents colluded to keep them as far away from each other as possible, while attending college, for an obvious reason. Hers sent her to Elmira, New York and his sent him to Philadelphia, Pennsylvania. It did not work. He graduated from college as a husband and the proud father of baby Jessica. Martha always said there was nothing in her life she was more proud of than being Jessica’s mother. Martha's passing leaves many broken hearts behind from her legion of relatives, friends and co-workers; none more so than Jeff’s and Jessica’s…and Gracie’s. A Funeral Service will be held in the Eaton Fneral Home, 1351 Highland Acve, Needham, on Thursday, Febraury 7th at 11:00 am. Relatives and friends are kindly invited to attend. Visitation will be held prior to the service rfrom 10-11 am. She will be buried at Needham Cemetery, alongside her younger sister, Priscilla Stover.